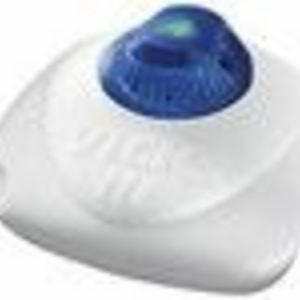 Vicks Warm Steam Vaporizer Works Great! If you have read any of my other VIcks products reviews, you'd know how much I absolutely love Vicks! When I was young my Mom and Grandmother always rubbed Vicks on my chest when I was sick or had a slight cold- they always told me that VIcks would make me feel better! They would even rub it on my chest after a warm shower after coming inside from playing on a Snow day. It was more than just a cold medicine- it wicked away my stuffy or runny nose and soothed me to sleep. I bought the Vicks Warm Steam Vaporizer when I got my first apartment. I was our first winter in our first apartment and we had very dry heat. So my Mom had mentioned to check out the Vaporizers and humidifiers. So I went to the store and when I saw the Vicks Warm Steam Vaporizer I grabbed it and basically ran to the register. I didn't need time to think about which one I wanted- I knew! I have used one ever since, and recently me and my Fiancé had a baby and she loves it just as much as we do! My favorite thing about it is that you can buy this oil to pour into a shallow cup on top of the Vaporizer, and it distributes the scent of Vicks throughout the room, so not only are you getting the warm steam, but your also getting the effects of Vicks Vapo Rub! But if you'd rather not have the scent of Vicks, you don't have to add the oil, so you could just have the warm steam. This Vaporizer does it's job. It takes the dryness right out of the air and it sooths you to sleep, just like when you were a little kid! It has a green light on it so you know when it's on, it also has a fill line so you don't add too much water. My whole family love the Vicks Warm Steam Vaporizer, I hope you do! Over the years, I have gone through a lot of humidifiers--and they have ALL been Vick's, as far back as I can remember. Currently, I have three in the house, one of which is probably 4 years old--and they all work like a charm. Output Volume Exceptional output volume--but still very efficient. This model will run most of the night on one filling--a real plus when you're sick and tired! Performance Like all Vick's humidifiers, this model performs very well. I have never had one fail to perform well for along long time--the average life span is about 5 years on a vIck's humidifier, even if you have really hard water or use it all the time. Ease of Cleaning Definitely an easy care humidifier--I run some vinegar through mine about once a month at most, and despite our highly alkaline water, my humidifiers last a long time. Durability Well--there really aren't too many ways to break one of these vick's humidifiers. I have dropped them repeatedly, dropped the element repeatedly, neglected to clean them with vinegar frequently, put eucalyptus oil in the water--you name it, I have probably done it, and all of mine still work. I have replaces several over the years, but not due to failure--when each of my kids left home, they stole a humidifier or two. Design Humidifiers aren't fashionable, but the vick's has clean lines and a functional appearance, it's very easy to use, and easy to see whether it is full or not. My only very mild complaint is I wish the cord were about a foot longer, since some of my outlets arein inconvenient places. I absolutely love this humidifier from Vicks. It's a smaller one so great for putting up high out of kids reach, yet still gets vapor in the entire room. 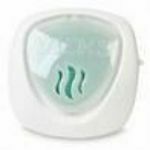 One fill up and the humidifier easily runs all night to help with any colds, coughs, or flu's you are dealing with. It is easy to set up and the mist starts up within five minutes, the light stays on as well to let you know that it's working. It's very easy to clean as well. I just run the top part under hot running water and any build up comes out the bottom, just make sure to not get the plug wet. Output Volume Just the right amount of vapor comes out. It's just enough to see it coming out of the humidifier but not enough to damage any furniture in the room. Performance Works very well, we've had ours for a few years now and it still works like it's brand new. Ease of Cleaning Very easy to clean. I take the top part off and run it under very hot water, any build up comes right out of the bottom. The bottom part I just dump out any remaining water and clean it out with some paper towels. Durability Has held up well these last few years. Design I like the smaller design of this humidifier, I can fit it up on a shelf so my kids can't mess with it. I'm a fan of Vicks, I have used it since I was younger. We needed a new humidifier and when I went to the drugstore before I bought it, I was actually reading reviews about it and it was a mixed feeling from everyone. I figured Vicks is a trusted brand so I bought it though it was a little pricey, but for my kids I didn't mind. The first night it seemed okay. It was quiet and seemed to be doing the job. However the next morning I noticed water underneath it on my sons nightstand. I figured I either did something incorrectly so I put it on again the next night. That's when I noticed something was not right. It sounded like it was vibrating and was loud enough that it was annoying my son. When I went in to check it again, there was water and I didn't even give a third night a chance and returned it for something much better. I was surprised and disappointed that it didn't work better, but to be honest, I ended up getting a better product for a cheaper price. I would not recommend it. Sorry Vicks. I bought this humidifier to help raise the humidity in our bedroom and it does the job. We live in a dry area and so the humidity levels in our house are low. I have been looking for both a one room humidifier and a whole house humidifier for a few months before I bought this one for our bedroom. I researched quite a bit on the Internet to see what was recommended for humidifiers. I choose this one because the reviews I found were good, people found it easy to use and keep it clean. We started to use this humidifier in February this year and it has kept the humidity in our bedroom between 40% and 50%. This has helped both of us feel better in the morning because the air is a more moist and we don't have the dry mouth or dry nasal passages as we had in the past. I feel that it has helped with allergy problems for both of us. I am so glad that we bought this product. Output Volume This humidifier has helped to increase our humidity levels in our bedroom up to 40% to 50%. The run time for this humidifier is a little over 12 hours. The humidifier box stated 18 to 24 hours but our water has a lot of minerals in it and so this humidifier produces a lot of steam. So, it runs out of water sooner than what is stated on the box. I am sure that if we used bottled water that it would run a lot longer. Ease of Cleaning Very easy to clean. I rinse the humidifier out everyday and then every week or two I soak the heater element part in vinegar to remove any mineral deposits. This is what was recommended by other people that have this product and the humidifier instructions recommend this too. Design This humidifier has a cup in the front of it near the steam output and I like that we can put a liquid inhalant in there to help during cold season. This produces a menthol smell and it makes it easier to breathe when we are congested. I did not like this unit. It was one of the first I ever tried when looking for humidifiers at the doctor's recommendation for upper respiratory issues. First off, the design is now incomprehensible to me, having seen and used other humidifiers since. The base that holds the water is very wide, therefore takes up a lot of space, yet the humidifier stops producing mist even before the base is out of water because the last of the water is spread over the large surface area of the bottom. Makes no sense. Output Volume The output is not good because it's too heavy to remain airborne. It moisturizes my furniture, not the air. Performance In addition to the condensation, the unit is loud and the noise increases as the water diminishes. Ease of Cleaning The cleaning of the container is actually easier than some other units because you can fit your whole hand and a sponge into the base. Durability It didn't stop working or break. Design I really don't like the design, which is space-consuming and requires frequent refilling. Overall it works pretty well. I dont really like the look of it and it is a little louder than i would like. I do like the fact that you can add vicks vapor in it. Output Volume It puts out a good amount of steam, but i dont like the fact that you can adjust the amount coming out. Performance It doesnt last as long as would have liked it to. Ease of Cleaning I hate cleaning this humidifier. It makes a mess and gets water everywhere. No easy way to do it. And it is aggravating to add the water because the base is so bulky. And because of the way it is made it is a little difficult to get all of the water out when you are finished with it. Durability It seemed to hold up but i was not impressed so I ended up selling it. I had it for a while and had no problems with it just a few things were aggravating. Design I do not like the design. I prefer a modern looking humidifier. I do like that it has a place to add vicks vapor liquid. That is very nice and helps the babies when they are sick and stopped up. For what it is this is an excellent humidifier. We use it when we are sick and it helps with my entire families cough and congestion and we do sleep through the night. I especially like it because we can put a little vapor rub in the top of the humidifier and the humidifier steams the vapor rub and distributes throughout the room. The magic behind this system is that the humidity not only helps relieve my nasal congestion and cough and helps me sleep through the night. but the vapor rub being in the air helps with the aches and pains and the steam helps to hydrate my skin. This humidifier is a win all the way around. Output Volume For a single bedroom this is fantastic. I would not try and use it in a large room or a living room but for a bedroom the out put is perfect. Performance This humidifier does exactly what it is supposed to dol Ease of Cleaning Changing the filter can be a little bit of a pain because it is not the easiest compartment I have ever tried to open but the large opening at the top of the canister makes cleaning the base easy. Durability I have had the one we use at our house for over 5 years and never had an issue with it working. Design This humidifier is small and fits nicely on a dresser. It is very easy to move around and the chambers make it easy to use. I bought this when my daughters pediatrician recommended that she have a humidifier in her room. She was suffering from a terrible cold and the humidifier would give her room the added moisture. I bought this Vick's humidifier and the solution to go into it. It worked like a charm for the first few times we used it. The steam would come out great, it was very quiet and the smell of Vick's helped her to sleep better. It held a good amount of water and would last all night on a low setting. I noticed that the condensation started to get worst every time we used it. I would have to put a towel under it to avoid ruining the dresser it was sitting on. I went to use it again and it would not turn on at all. I don't think this product is very durable at all. Output Volume This humidifier is very quiet and did not disrupt my daughters sleep at all. Ease of Cleaning It is not the easiest to clean, but I don't think any humidifier is. Durability This product broke after we only used it a few times. My first born was sick and I needed a humidifier. I looked at a few different ones and decided to go with this one. It's pretty simple and it was inexpensive. I decided to try it and hoped it worked. It worked great! I love that it has the night light feature on it. It's very light and easy to use. The cord is long enough depending where you want to use it at. It's also very easy to clean. I used it when my kids would have a runny nose or a cough. I also use the vicks packages that go with it. I love the clean smell. It's also not too loud. Personally, it's soothing to me. I would recommend this product. A lot of the other products sold for babies are good but this works great and for the price it works better. No need to spend more for one that is shaped like a monkey! Ease of Cleaning The humidifier had a wide opening making it easy to clean. Design It's very simple and nice. It's not flashy of has animal shapes like a lot of the ones for babies but it does the job.